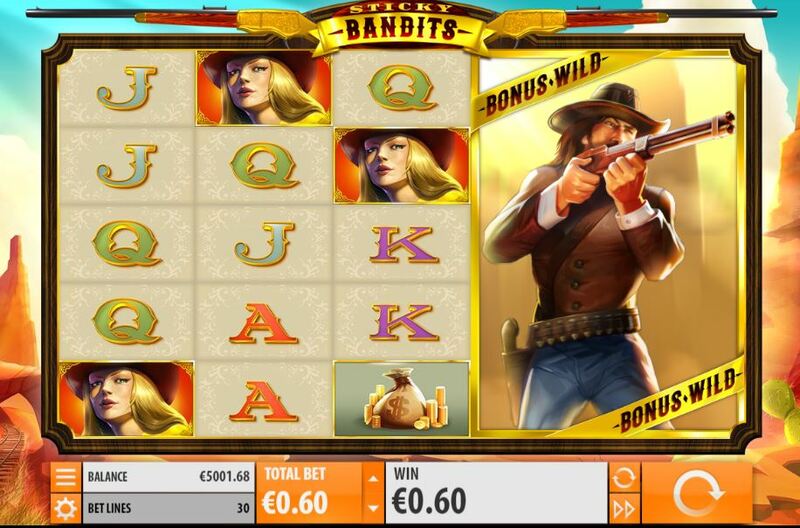 Sticky Bandits slot is a very basic slot and appears to be a case of Playtech's Jungle Giants meeting Netent's Wild Wild West so considering cross-breeding may produce some unwelcome results, Quickspin seem to have taken a chance with this game. You have music from the old Western films as you play on the reels set against the background of a desert plain which at least has a railway track running through if you need a way out. There's a lot of weapons and dynamite in view around here too, so can our bankroll escape detonation and is there gold in them there hills? We are given 30 pay lines over a surprisingly large grid of 5 reels and 5 rows. All the icons are stacked fully bar a special scatter on reel 1 and given the format the pays aren't ever going to be high. 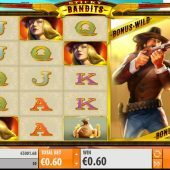 You pay 30 coins to play and the Cowgirl awards 200, Purple Cowboy 100, Blue Cowboy 80, Gold Bag or Dynamite 60 with four card values paying 40 or 30 coins for a full 5-of-a-kind. By now you'll be expecting to hear about the Wilds and they are giant 2x5 stacks appearing on reels 2 and 3 along with 4 and 5 each taking the form of an armed Bandit character. No multiplier is awarded but they do have an additional function when it come to the bonus trigger as we are going to find out. There is an individual bonus scatter on reel 1 and when this appears you will see reels 2 and 3 then 4 and 5 spin slowly for the 'heartstopper'. This is because any part of one of the giant Bandit Wilds in view will then trigger 7 free games which cannot be retriggered. The enhancement in these is the fact that any Bandit Wilds in view on the trigger remain sticky for the duration of the free spins - Sticky Bandits! If you trigger them with say just the bottom two positions on reels 4 and 5 covered by the Wild then this is pretty dire for your prospects it has to be said.